How may the 'beast from the east' affect our health? home > health > immune system > how may the 'beast from the east' affect our health? Find out how the latest cold snap may affect our health. With the country in the midst of an extreme cold snap, you’ve probably been forced to think about how the weather will affect various aspects of your life. Getting to work safely for example, is likely to be your number one concern, along with figuring out where the sledge has disappeared to! Here at A.Vogel we can’t dig you out of the snow or deliver fresh milk when the shops have run out, but we can help you out when it comes to health! That’s why today we are looking at how the so-called ‘beast from the east’ may affect our health. 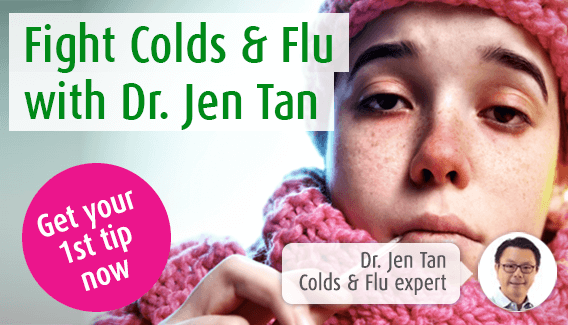 Can cold weather cause colds? First and foremost, let’s set this rumor straight! Colds and flu are caused by different viruses and are spread from one person to the next through a cough for example, or a sneeze. So, with the germs travelling from person to person, you are actually more likely to catch a cold or flu indoors, where people are in close proximity to one and other, than out in the cold. Also, it takes a few days for a virus to show itself through symptoms like a sore throat or a cough. This means that if you do come down with something during a cold snap, it’s probably just a coincidence as you would have received the virus a few days before. Therefore, you should be able to sledge happy in the knowledge that the snow and ice might make you a bit chilly, but it won’t give you a cold or flu! Unfortunately, there are a few health conditions that can get worse with the onset of winter weather. The cold air is known to worsen asthma symptoms for example, such as wheezing and shortness of breath. Normally, the nose, mouth and throat would moisten air before it reaches the lungs however, if the air is cold the body is unable to do this and it can lead to spasms or twitching, and therefore difficulty breathing and coughing. To help sufferers through the winter season, Asthma UK provides a really great action plan. Muscle and joint pain, as well as arthritis, is also known to worsen during the cold season. This may be linked to the fact that when the weather is bad, people are less able to get out and about to loosen up their joints. Therefore, when it’s cold it may be a good idea to find a relaxing, indoor activity that will keep your body moving and maintain strong muscles and joints. Swimming is an ideal place to start as it is low impact and helps to stretch out all of your muscles. However, if the weather makes travel to your local pool impossible, it is worth trying a herbal remedy for some relief from your muscle and joint pain instead. Our Atrogel Arnica Gel gives relief from sore muscles and joints, as well as problems such as a stiff neck and shoulders. It turns out it isn’t just a viral cold that causes problems for your nose – the cold weather itself is enough to play havoc! Low temperatures for example, can cause the skin inside the nose to become irritated, dry and cracked. This can lead to the additional problem of nosebleeds which are known to increase in frequency with the onset of winter. Plus, we’re all familiar with the problem of a ‘runny nose’ whenever we brave the elements. So, keep yourself wrapped up warm when you venture outside and keep your tissues handy! You could also help your nose out by using a herbal remedy product such as Sinuforce Dry Nose Nasal Spray. This will moisturize and sooth your nasal passages but not only that, it helps to support a healthy nasal mucosa to prevent nose bleeds. For many people, the cold weather can have a negative effect on the lips. The icy air for example, can make them dry, thin and cracked – a problem known as chapped lips. However, cold sores, which are small blisters that appear around the mouth, are also common during the winter season. This can be painful and uncomfortable but, as we noted in our blog ‘6 ways to prevent a cold sore outbreak this winter’, there are many things you can do to prevent cold sores and treat them as well. Eczema and dry skin are some further examples of conditions that, for many reasons, can get worse in winter. As we discuss in our blog ‘why is eczema worse in winter’, the cold air outside takes away essential oils within the skin thus causing irritation. Plus, sometimes just wearing lots of heavy winter clothing, or regularly moving from very cold to very warm conditions, can make symptoms worse. To address the problem we’d recommend moisturizing regularly. Our Soothing Neem Cream is ideal for this as it suits those with very dry skin or eczema. It helps soothe irritated and red skin and seals moisture into the skin to prevent those essential oils from escaping! It’s best to do this just after washing as that’s when the skin is most moist. Loneliness can become more pronounced during times of extreme cold weather because people are less able to get out and about and continue with their routines. This means they don’t see the people they would and can feel cut off or isolated. It’s not easy to deal with this issue but the best place to start is by talking. If you can’t meet your friend for your usual coffee because of the weather then make a cuppa, given them a call and sit down for a chat. Also, if you can’t get out then invite neighbors or family over who can. Snow and ice can be problematic for long periods at a time but there are things you can do to address the problem of loneliness during winter.